RANJO.com - NHL Players Who Redefined The Word "Tough"
Ask anyone who knows hockey who the greatest player of all time is and the most common names will sound something like this: Wayne Gretzky, Bobby Orr, Mario Lemieux and Gordie Howe. Ask those same people "Who was the roughest?" and you'll hear Gordie Howe's name again. The man they call "Mr. Hockey" was a point-producing machine for the Red Wings during the 1950's and 60's all while fortifying his reputation as one of the toughest men to handle physically in all of the NHL. Known for the use of his elbows as well as his fists, every NHL'er knew the risk of heading into the corners against Howe in pursuit of a loose puck. Perhaps Howe's greatest showcase of his strength came in February of 1959. Squaring off against the New York Rangers, Howe found himself in a battle against Rangers tough guy, Lou Fontinato, that had been brewing for sometime. The two had been trading shots for the last couple of seasons, both managing to carve up the other on separate occasions, but Howe vowed to get the final word in this battle. During a battle behind the Rangers' net, Howe would get his opportunity. 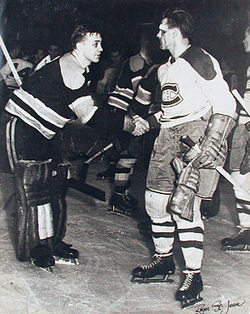 As Howe jumped in to aide another teammate, Fontinato jumped from the New York bench to seek out Howe. Suddenly, Howe spotted Fontinato rushing in towards him and ducked the initial attack. Howe then reacted, quick as lightning, "that honker of his was right there, and I drilled it." Howe continued to hammer away at a dazed Fontinato. Some players were quoted as saying it sounded like, "someone chopping wood." In a matter of seconds, Howe had taken the 6-foot-1 and 195 pound enforcer and broken his nose, dislocated his jaw and won the war. Like the picture says, folks: "Don't Mess Around With Gordie." When you think of the "Broad Street Bullies" and the Flyers of the 1970's you picture blood, guts, fists, and what some might call an un-healthy love of inflicting pain on other NHL teams. While it took an entire team to forge their reputation as the NHL's most-hated team, one man came to become the face of the "Bullies". Dave "The Hammer" Schultz didn't have a long NHL career, but it was long enough to rack up 2,294 penalty minutes during his career, with an NHL single-season record of 472 minutes during the 1974-75 season. If you're the face of the "Broad Street Bullies", you're surely going to be on any tough-guy list I write, personal safety concerns aside. No man personified "Old-time Hockey" like Eddie Shore did. The Bruins' bad man earned a reputation as a tough customer, sometimes bordering on dirty, through dogged determination and a knack for throwing bone-crushing hits. One such hit in 1933 nearly crossed the line for Shore, though. A check from behind on Leafs' player Ace Bailey sent Bailey to the hospital with a life-threatening skull fracture. Bailey would survive, even going on to forgive Shore for his actions. Aside from nearly unintentionally killing a man on the ice, Shore was no stranger to injury himself. Shore nearly had an ear ripped off during a violent on-ice collision and refused anesthesia. He didn't stop there, though. Shore asked the doctor performing the procedure to give him a mirror so he could watch the doctor sew his ear back on (Presumably because sitting there bleeding was too boring for Shore). Probert was considered the top-dog when it came to throwing fists. He was the target of many aspiring tough guys, eager to prove they had what it took just to stand toe-to-toe with Bob Probert. Over a career with the Detroit Red Wings and later on the Chicago Blackhawks, Probert amassed a whopping 3,300 penalty minutes. Some of his most memorable bouts came against Tie Domi, to the point where the winner of each meeting would be dubbed the "Heavyweight Champ of the NHL." The shortest man on this list may have had the most "snarl per inch" of any man in the league during his playing days. Domi made a career out of defying the physical odds against him, pummeling larger opponents while taking massive punishment, seemingly without it affecting him. A career total of 3,515 PIMs lands Domi at third all-time on the NHL's rankings. The battles between Domi and Probert were enough to convince any man of Tie's toughness and I'm not any different. A man that numerous babies in Toronto have been name after was one of the rare men in the NHL who played as physical as anyone, but had quite a touch for producing offensively for his team. Multiple 30-goal seasons during his time with the Maple Leafs is prove of Wendel Clark's ability to lead by example. The threat of being hit by the force of a semi-truck let opposing players know all they needed to know about Clark and is enough to land him on any "Tough-Guy" list. Anywhere. The last player, but certainly not the last tough guy in the NHL, is Chicago goaltender Glenn Hall. At a time in the NHL that pre-dated backup goaltenders and goalie masks, Hall was a shining example of the toughness of a hockey player. During his career he set a record for consecutive games played that still stands today (502). Playing that many games in a row while standing at arguably the most dangerous position in sports is nothing short of remarkable. Add in Hall's quirky pre-game ritual of getting so nervous that he would vomit before each game it becomes even more amazing that he didn't miss a day of work from 1955-1962. What's that? You don't feel good and might miss work?